This is one of the best outdoor shirts, if not the best for the money. Its just a simple, straightforward design, well cut, double stitched with bar tacks, two breast pockets, snaps for closures (very easy to use and durable too) and made from the strong G1000 material. Excellent as a mid layer or on warm or hot days as a comfortable outerlayer. Nice collar doesn't get in the way and turns up well to cover your neck. The materials breathes very well, dry quickly and is very comfortable, it washes well, is very tough and overall the shirt is well put togeher. 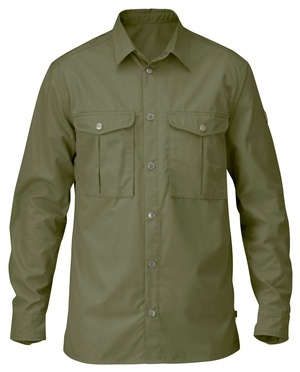 Durable long-sleeved shirt with regular fit for trekking and everyday use. Made from a soft, unwaxed G-1000 that dries fast and is comfortable to wear. Perfect for trekking and other high-intensity outdoor activities when you want something that is hardwearing yet still ventilates well. Two spacious chest pockets with flaps and bellows provide practical storage for smaller items. Press buttons in the front, on the sleeve cuffs and pockets. The fabric has in-built UV protection equivalent to UPF 40 . Purchase through PayPal by using the "Add To Cart" button above or use the form below to order the Fjallraven Greenland Outdoor Shirt . Feel free to contact us if you have any questions about the Fjallraven Greenland Outdoor Shirt .